BURAS, La. 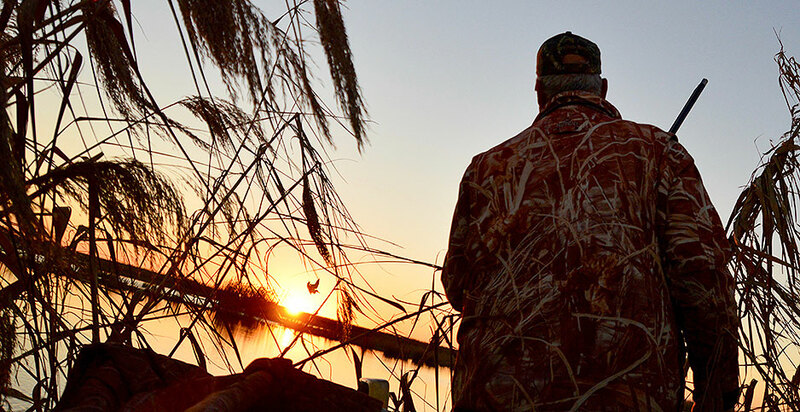 — Two drake pintails swoop across the dawn sky toward a duck blind where Carl Boudreaux and Ryan Lambert are waiting. The pintail had likely flown more than 1,000 miles to this swath of Mississippi River Delta. Nobody knows that better than Lambert, who's been guiding hunters and anglers into the marshes here for some 40 years. Prairie potholes could soon lose their Clean Water Act protections under a Trump administration proposal to erase coverage for wetlands lacking surface connections to larger waterways (Greenwire, Dec. 12, 2018). Lambert, 61, supports President Trump despite the administration's wetland proposal, but he wants Midwestern farmers to realize how their actions affect wildlife, the environment — and him — far downstream. 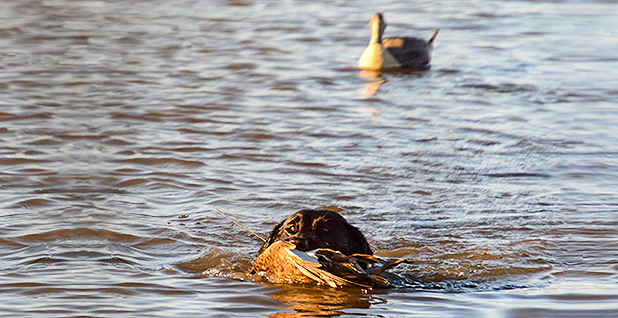 "It's bad for our ducks, it's bad for our fishing, it's bad for the algae blooms and our dead zones, because now you don't have no filtration," he says as his black Labrador, Kenley, retrieves the fallen pintail. "The farmers say draining doesn't affect anything because 'it's not connected,'" he continues, gaining steam. "It's not connected? Shoot! Everything north has to come south. That's the way it works." When Lambert says "everything," he means everything that matters to people "living off the land" in southeast Louisiana: ducks and water. He wears his connections to the land on his sleeve and around his neck, where a lanyard holds four duck calls and 20 or so metal bands that government agencies attached to the legs of ducks he's killed. Hunters can call telephone numbers on the bands to learn where migratory birds they bag were born and raised. Nearly all of Lambert's ducks come from the Prairie Pothole Region. Pintails, blue-winged teals, gadwalls and mallards all breed there in the spring before flying south to winter in Louisiana, Texas and Mississippi. But those wetlands are shriveling. They've been ditched and drained over a century to make land suitable for growing corn, soybeans and other crops. Ducks need many scattered wetlands when they breed because they are territorial at mating time. Fewer potholes means fewer options, and ducks pushed too close together will spend time defending their territory instead of mating. The result is a slow, steady decline in waterfowl populations over generations. "It's getting worse and worse every year. The draining is getting to be a bigger and bigger deal, and there's less and less ducks," says Lambert, who runs Cajun Fishing Adventures, about 60 miles southeast of New Orleans. "You need somebody old enough to know how it was to tell you how it is." This year's duck season has been unusually bad, due in part to the Mississippi River's rising waters. Lambert blames drained potholes for that, too, as there are fewer wetlands up north to capture, hold and cleanse floodwaters. The river usually rises each spring when rain and snowmelt in its upper river basin are sent rushing downstream. This year, the river began rising in October because of heavy rains. It's expected to reach flood stage in Louisiana this month. Mild temperatures across the country meant a lot of ducks simply didn't fly all the way south this year. With so much water being sent down the Mississippi River, ducks that did make it to Louisiana spread out over the waterlogged areas and didn't congregate in marshes stalked by hunters like Lambert. Lambert himself has an expert eye. Seeing specks in the sky, he'll identify the species, imitate their sounds, and call them into shooting range. "Not many bird-watchers know birds as far as I know birds," he brags. But Lambert, who claims he bags 6,000 ducks a season, says he'll be lucky to kill half that this year. So on this January morning, between celebrating successful kills with Boudreaux and worrying about his dog Kenley getting too cold, Lambert will spontaneously complain about what's happening to duck habitat on the prairies. With intact prairie potholes, he says, the water on the Mississippi Delta wouldn't be so high right now, and there'd be more ducks to hunt. "If everything goes down the drain tiles they have up there, it goes into canals, and the next thing you know, it's in my Mississippi system," he says. "There's nowhere to keep the water, so it all flows down here." The bad season isn't hurting Lambert's business — yet. His lodge offers fishing trips and eco-tours year-round. During the 76-day duck season, it operates on a "blast and cast" schedule of hunting in the morning and fishing in the afternoon. But hunting is about more than killing ducks to Lambert. It's an expression of love for the animals and the ecosystem. Lambert speaks with a comforting Cajun drawl. Barrel chested, he’s light on his feet in the duck blind, swiftly pivoting from a seated position to shotgun-ready at a moment’s notice. When he’s hunting, Lambert is covered in various patterns of camouflage meant to mimic the marsh’s vegetation. His jacket and undershirt are camo. So are his sunglasses and shotgun. He's out on the marsh every morning of duck season, leaving the lodge before dawn to lay out decoys and hide his boat behind stands of roseau cane just as the sun rises. Most of the prep work occurs in total darkness, save for the distant glow of belching fire from a refinery across the river. As he waits for ducks, Lambert watches pelicans, egrets, dolphins and other animals that inhabit the bayou. "If you watch all the birds and the animals, they all have a part to play, and they are all perfectly designed for the part," he says. "The same thing is true for the rivers and the streams and the wetlands. "They are all there for a purpose, and every single time we alter it, we mess up." Lambert has seen firsthand how wetland destruction affects wildlife. Historically dependent on the Mississippi River sending them fresh water, sediment and nutrients, the marshes were cut off by levees built in the wake of devastating floods in the 1920s. Without a constant supply of Mississippi River mud, Louisiana wetlands are disappearing at a rate of a football field every 38 minutes. Thousands of shipping channels cut through the marsh also direct salt water to the wetlands, killing freshwater vegetation. Lambert has watched the land where he camped on his first duck hunts as a kid "sink into an abyss." An accountant, Lambert's father wasn't much of a hunter, but he gave his son a shotgun when he was 10 years old. From then on, Lambert and his cousins went from shooting backyard squirrels with BB guns in the New Orleans suburb of Luling to hunting ducks "in the swamp." "It absolutely became part of us," Lambert says. After high school, Lambert became a technician at a Monsanto chlorine plant. He worked nights so he could hunt and fish during the day. He also ran a small sporting goods store. When customers asked if he knew any guides, Lambert took them hunting. Eventually, he says, "the guiding got so good, I was losing money going to work, so I quit." In the 1980s, he opened his lodge off Louisiana Highway 23, where the levee and the road separate the Mississippi River from the delta. The levee was no match for Hurricane Katrina, which drowned the lodge under 21 feet of water in 2005. "You can't even build a levee high enough to compete with a hurricane eyewall," he says. "You have to restore the marshes so they can absorb the storm surge." Lambert is well-known in southeast Louisiana for advocating coastal restoration projects that divert the river to send sediment toward depleted marshes. After the Deepwater Horizon oil spill strangled his business in 2010, Lambert testified before Congress four times. He always told lawmakers that restoring the marshes was just as important for Louisiana's wildlife as cleaning up the oil spill. "I feel so cool, because I've got my little 12th-grade education and I'm teaching senators," he recalls. "It's not even natural. But they like to hear what I've got to say, because I learn it from the land." Lambert was always aware of how conditions in the Prairie Pothole Region affected Louisiana duck hunting. He remembers when the state lowered bag limits in the 1970s after hatch rates fell from a drought in the Upper Midwest. As he became known as a coastal restoration advocate, environmental and conservation groups would approach Lambert to talk about how other activities in the Mississippi River Basin affected his business. He started paying attention to and talking about prairie potholes. "I saw it is so much bigger than just where I live," Lambert says. "It is a system." In 2013, the nonprofit Theodore Roosevelt Conservation Partnership brought Lambert to South Dakota and farmers from the Upper Midwest to southeast Louisiana. The two groups talked about how draining wetlands to grow corn for ethanol could affect everything from the water levels in the Mississippi to duck populations to the Gulf of Mexico's "dead zone," where nutrient pollution from farming has depleted dissolved oxygen levels that fish need to breathe. 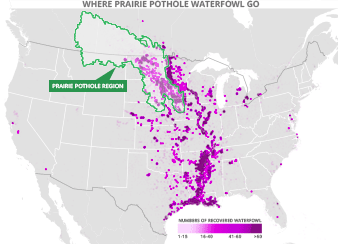 Why do waterfowl love prairie potholes? Millions of ducks and geese breed each spring in the Prairie Pothole Region — named for shallow, water-filled depressions created by retreating glaciers at the end of the last ice age more than 12,000 years ago. Because the potholes don't support fish, waterfowl have little competition for food. And they are near-ideal for breeding ducks that need small, scattered wetlands because they are extremely territorial. If ducks are pushed too close together, they will waste time defending their territory instead of mating, Ducks Unlimited's Johann Walker says. "Ten 1-acre wetlands will carry three times as many ducks as one 10-acre wetland," he said. And because the pothole region sprawls across parts of the Dakotas, Iowa, Montana and Minnesota, as well as the provinces of Alberta, British Columbia, Manitoba and Saskatchewan, there is abundant room there for ducks. What's the link between the potholes and marshes along the Gulf of Mexico? 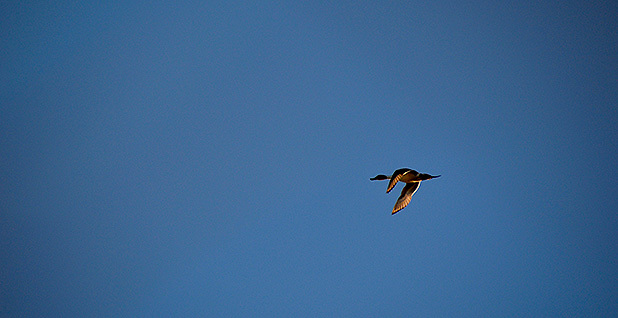 Waterfowl follow flyways south along the Mississippi River. Six duck species that commonly nest within the pothole region make up 60 percent of the total duck harvest in the five Gulf Coast states, according to the Fish and Wildlife Service. How do farmers affect prairie potholes? Prairie potholes have been ditched and drained for more than a century to create fertile farmland. Most wetland losses occurred before the 1980s, but wetland draining is ongoing. Some areas of the pothole region, like Iowa, have lost more than 90 percent of their wetlands as a result. Federal incentives also encourage farmers to preserve prairie potholes. The Iowa Farm Bureau says farmers in its state there have restored more than 247,000 acres of wetlands through U.S. Department of Agriculture programs with the Farm Service Agency and Natural Resources Conservation Service. How might WOTUS affect prairie potholes? The Trump administration's "Waters of the U.S.," or WOTUS, rule would erase protections for more than 51 percent of the nation's wetlands — including prairie potholes — that don't lack permanent surface water connections to streams and rivers. Eliminating Clean Water Act coverage for these wetlands means farmers wouldn't need a permit to drain more potholes, and thus would not have to pay to restore similar wetlands in the area if they received a permit. The prairie potholes Lambert saw on that trip didn't seem large enough to justify draining, given the negative impacts. "They are doing it for what? An extra bushel of corn?" he asks. Then he adds, "We are just as guilty as them, though, because we built that levee and send all their pollution to the Gulf of Mexico instead of to our own wetlands." His bottom line: "It's all an evil, twisted chain of events that has caused this, and it's all man-made. I don't know if climate change is man-made, but I know this is. I've seen it with my own eyes." After years of watching Louisiana's wetlands disappear, Lambert has organized a $1 million project with Ducks Unlimited — funded largely by the federally backed North American Wetlands Conservation Council — to build 2,500 acres of new land by installing "terraces" to slow the movement of water and capture sediment in Louisiana's Bay Denesse. Lambert says he's taken responsibility for how Louisiana's actions hurt the Mississippi River. He wants farmers "up north" to do the same. "It's very disheartening to me that a farmer who makes his living off the land like I do can do such a thing without caring about what happens downstream or even at his own place," Lambert says. "It's like they are saying, 'The hell with the ducks.'" To be sure, not every farmer drains prairie potholes. Federal programs pay farmers to preserve wetlands on their property, and eligibility for crop insurance is tied to wetlands conservation. But incentives aren't always enough to prevent pothole drainage, and high commodity prices can skew the calculations. Excluding prairie potholes from Clean Water Act protections erases costs farmers must pay to drain wetlands in compliance with the law. While he's well-tuned to politics, Lambert says he doesn't closely follow the debate over wetland regulations. But he knows the Clean Water Act exempted many farming activities and that farm industry groups continue to argue prairie potholes aren't connected to downstream waters. "They get exempted from everything just because they get lobbyists to say it's not connected, but we aren't exempt down here," he says. Lambert says he's "heard a bit" about how the Trump administration is trying to change which wetlands and waterways are protected by the Clean Water Act, and how the Obama administration would protect prairie potholes but the Trump administration wouldn't. While Lambert acknowledges that the Obama administration would have protected prairie potholes, he adds, "his regulations wouldn't let me bring ducks home from Mexico because of avian flu." "Migratory birds fly across borders on their own," he scoffs. Still, Lambert says, he wishes federal regulators would "come down here and see the cause and effect of what they are doing" by rolling back Clean Water Act protections. "Maybe they will change their tune a little bit," he says. "You can't see it from your office in Washington."